I finally finished our first Dungeons & Dragons 5e campaign last month – and to celebrate the end of the campaign I made a poster-map that I gave out to all the players in the group as the campaign wound down. Over a week and a half, I took the original map that I drew up for the campaign (last spring, about two-thirds of the way through the game) and expanded on it and drew it at a much larger size – where the first map took up most of a letter page, this version took up four sheets of paper. 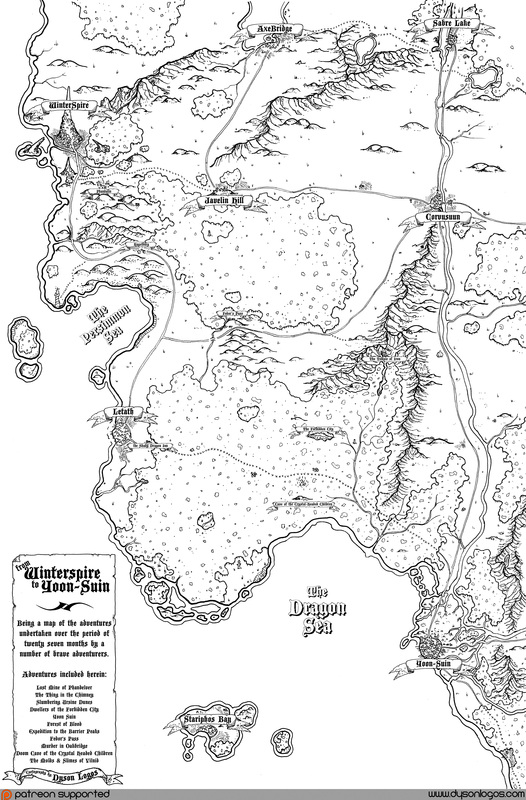 The campaign started as a slightly modified version of the D&D5e starter adventure, “Lost Mine of Phandelver” – but my aversion to the Forgotten Realms meant mashing and mangling the setting a bit. So I started the campaign, and my redraw of the campaign map, with Winterspire, my replacement for Neverwinter. Winterspire is a city built on the ruins of the old space elevator. The top of the spire is perpetually covered in snow, and living in the upper sections is a sign of abundant wealth because it means you can afford to have coal or firewood shipped up the spire to heat your house year-round. In the end the adventure travelled around a lot, explored a few cities and adventure modules (listed in the map above) and was a lot of fun. This redraw of the map was almost as much fun to do – I feel a lot more confident in my skills as a cartographer and even a bit as an illustrator. I also discovered that I can get my larger B&W works printed for a pittance at Staples using their Engineering Prints – up to 36″ x 24″ B&W prints on 20lb paper for only $3 per copy. I hope you enjoy this map, it was a LOT of fun to draw and I’m exceptionally proud of the end product. A beautiful map. I assume your players were extremely pleased? AWESOME…..now thats map to be proud of……A+ in my map trove……and i have thousands……best maps are the homebrew….where legends are born….. I really want to know more about Winterspire. Wow, super impressed with the map! Now if only I could get my players to actually stick around for a campaign. I too would love to hear or see more about Winterspire! Great job as always Dyson! A nice Fighting Fantasy vibe coming off this one. Good work. This looks impressive! Well done! This map took six months I think and the sacrifice of three maidens. I love this. I would love to hear more about your changes to the Phandelver adventure and any other notes about your campaign. s=secret door; c=concealed door. What does ‘f’ stand for? Also, are there/will there be maps for other cities on the “Eastern Shore”, such as Winterspire? Probably not any time soon, to be honest. I just finished another 5e campaign set on the east coast of the same continent and haven’t revisited the Eastern Shore since this campaign ended at the beginning of 2017.